A former colleague holds complete conversations in his head with people with whom he is angry. He rarely speaks directly with the other person. This anger in his mind continues to build because of his frustration, yet he never lets the other person know that he is frustrated and subsequently angry. His conflict avoidance almost cost him his marriage because he didn't let his wife into the conversations he was having with her but by himself in his head. It was almost too late by the time he did bring her into the real conversation. His need to avoid confrontation is so strong that he has a safe confrontation in his mind and feels that he has dealt with the issue. As you can imagine, this doesn't work—especially for the other person involved who doesn't even know that they are involved in the conversation. Do You Hold Mental Conflict Confrontations or Practice Conflict Avoidance? Many people are uncomfortable when it comes to confrontation. You can understand the concept of having the conversation in your head; so you can plan out what you want to say and how you want to say it. Sometimes these mental conversations are enough to settle the issue, as you realize you are making too much out of a simple situation. Many of you know that you have spent hours lying in bed at night having conversations with people with whom you are angry and frustrated. Not only does this practice disrupt your sleep, your attitude, and your health, it never really resolves the issue, and this approach is also potentially damaging to your relationships. Don't get this advice wrong, you don't need to confront every action that other people take. If you have the conversation once in your head, don't worry about it. If it comes back and you have it again, perhaps start thinking about holding a real conversation. Or, figure out what you are afraid of that you are avoiding an essential confrontational conversation. By the third in your head confrontation, you need to start planning how you will deal with the real confrontation because it looks as if you are going to need to have one. For example, assume you want to confront your coworker for taking all of the credit for the work that the two of you did together on a project. Instead of saying, "You took all the credit, blah, blah, blah..." and venting your frustration, which is what you might say in your mind, rephrase your approach using the above guidelines. Say instead, "It looks as if I played no role in the Johnson account. My name does not appear anywhere on the document, nor I have been given credit anywhere that I can see." When the person you are confronting responds, allow them to respond. It's a human tendency, but don't make the mistake of adding to your initial statement, to further justify the statement. Defending why you feel the way you do will generally just create an argument. Say what you want to say (the confrontation), then just allow the other person to respond. You want to listen very carefully to catch the differences between what your initial statement indicated and your coworker's response. This is not a time when you should rehearse responses in your mind. Just listen effectively and stay open to the possibility that your coworker has a good reason for the actions taken. Especially since you've probably held the conversation in your head a few times, you may think you know how the other person is going to respond. But, it's a mistake to jump to that point before they have the opportunity to respond. Resist the temptation to say anything else at this point. Let them respond. Confrontation does not mean fight. It means that you need to state what you have to say. Listen to what they have to say. Many times the conflict actually ends right there. Do you need to prove the other person right or wrong? Does someone have to take the blame? Get your frustration off your chest, and move on. If you approached your coworker with the initial statement, "You took all the credit, blah, blah, blah..." her response is likely going to be quite defensive. Perhaps she'll say something like, "Yes, you have been given credit. I said both of our names to the boss just last week." If you already know what you are looking for in the confrontation, this is where you move the conversation. 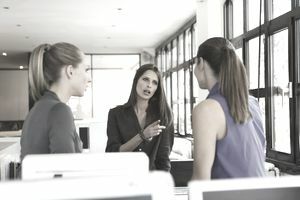 Don't get into an argument about whether she did or didn't mention anything to the boss last week—that isn't really the issue and don't let it distract you from accomplishing the goal of the confrontation. Your response could be, "I would appreciate if in the future that we use both of our names on any documentation, and include each other in all of the correspondence about the project." The other party will either agree or disagree. Keep to the issue at this point, and avoid all temptation to get into an argument. Negotiate, but don't fight. That's it. It isn't about blame, about who is right or wrong or anything other than your desired resolution. You want to affect how this issue is handled in future projects you work on with this individual. They will remember that you called them on their bad behavior. You will rarely look forward to confrontation; you may never become completely comfortable with, or even skilled in holding a confrontation. However, it is important that you say something when you are frustrated and angry. If you can't stand up for yourself, who will?